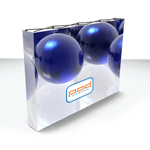 The Hop Up Tension fabric system is a large format graphic display suitable for all indoor display environments. For exhibitors looking for an easy to use, portable system with seamless graphics, the hop up stand is one of the simplest on the market. The Hop Up system consists of an anodised frame that expands out to create a stable framework. 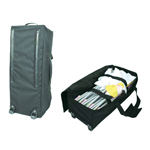 The fabric graphics stay attached to the expanding hop up frame, so no tools are necessary. 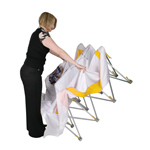 The fast assembly means it’s the ideal choice when it comes to setting up at shows, demonstrations or exhibitions. The quality fabric used on a Hop Up stand has a high polyester content with elastane in the weave to ensure an even stretch across the frame. The dye sublimation printing creates quality fabric graphics. This makes achieving an impressive back wall of graphics simple and cost effective. 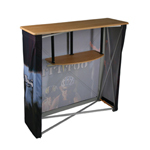 The fabric pop up display Hop Up is very different from the standard type of Pop Up display, as it uses only 1 piece of fabric graphic attached to a collapsible frame. As the graphic remains attached the Hop Up can simply be removed from the case and set up in a matter of minutes. The locking arms simply push fit together. 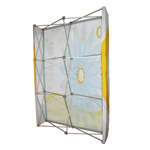 The Hop Up is also lighter than traditional graphic Pop ups, weighing just 8kg for a 3x3 size frame. The system is hard wearing, and if the fabric panel gets dirty then it can be put through a standard wash in a washing machine. Call today on 01933 411159 to try out the Hop Up for your next show or event.